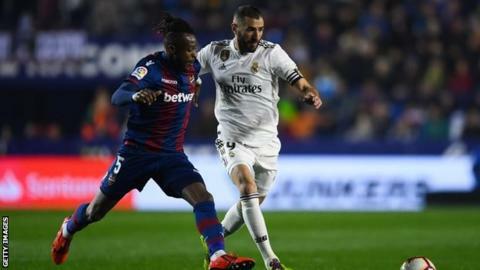 Ivory Coast and Levante midfielder Cheick Doukoure's participation in June's Africa Cup of Nations is in doubt after injury ruled him out of the rest of the Spanish season. Doukoure damaged the cruciate ligament in his left knee when challenging Real Madrid's Casemiro on Sunday. "Doukoure flew to try to clear the ball and landed with his left leg completely unbalanced," said Levante. "Thanks for all the support. Don't worry I'll never give up," Doukoure added on Twitter. "See you next season. There [is] always worse than you. That's what my mom taught me. Love you all." Doukoure has since made nearly 20 appearances for the Elephants, including four to help them qualify for this year's Nations Cup in Egypt.